Mickey and Minnie count down to Halloween! I’ve written a lot about how important Halloween was to Ben and me. 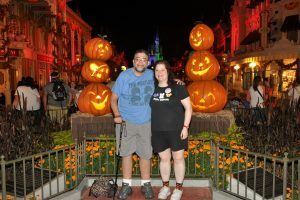 Our favorite time to visit Walt Disney World was during the fall when we could celebrate my birthday and Halloween. I still hear Ben singing along with the Boo to You parade at Mickey’s Not So Scary Halloween party. 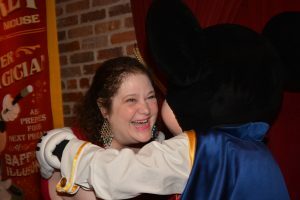 Most exciting was that Ben proposed to me on Halloween at Walt Disney World, which was absolutely perfect, but now adds a melancholy of the holiday. Fall has become a strange time for me. The beginning of a school year has the shadow of memories of the anniversary of losing Ben. Fall, which was our favorite season, largely because of Halloween, does not hold the same sense of whimsy. I don’t feel the same dread of seeing Halloween decorations and candy assortments that I did for the past few years. I do tend to think about how Ben and I would have been thrilled to see Halloween invade the shops, and how I would have been taking photos to text to him, once ALS had progressed and he was homebound. I have lacked the enthusiasm for the holiday that I used to have, but I found that this year, I missed feeling that enthusiasm. I have not decorated the apartment for Halloween since Ben has been gone. I have kept our Halloween things in storage. The last time I saw them was when I brought them to Ben’s hospice room. His doctor suggested that bringing things Ben loved to his room would make him more comfortable. Although it was August, celebrating Halloween in the summer was not a new idea for us. 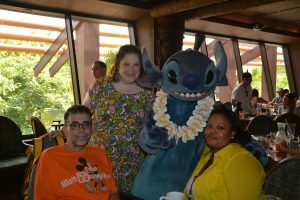 After all, we had Halloween at Walt Disney World in July in 2014, thanks to the wonderful Walt Disney World team (click here for that post). Ben did get such a kick out of seeing our Disney decorations in his room. Decorating the room was also a soothing distraction for me- it kept me busy and let me focus on creating smiles rather than dwelling on Ben’s imminent departure from this world. I haven’t wanted to display those decorations since that time, but Halloween remains a Ben and Disney kind of holiday for me. Although I cannot resist peeking at the Halloween section of the Disney web site, I cannot add to our collection without Ben because it almost feels like a betrayal. This year, I considered buying a “Boo to you” mug, because Ben loved that parade so much, but I did not think it would bring me much comfort or joy. Maybe one day, but not yet. This year, I was looking at a recent catalog from The Vermont Country Store, one of our favorite places. We spent hours there each time we went to Vermont and we frequently ordered online from the store. I have continued to order many things- they have such a fantastic collection of items, from nostalgic to practical to whimsical and fabulous- but I had not ordered any of their wonderful Halloween items. I always feel a combination of joy and sadness as I look through those pages. 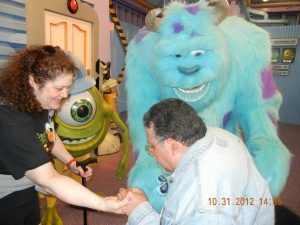 Choosing Halloween items for our collection was a very special event for Ben and me that is painfully lonely by myself. As I perused the catalog, I have to say that I perked up when I spotted tiny Halloween Hurdy Gurdy music boxes. One of them played Grim Grinning Ghosts. Ben so loved the Haunted Mansion and the song. 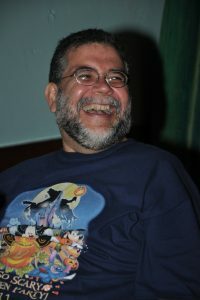 He actually used to joke that when he left this world he was going to become one of the Grim Grinning Ghosts at Walt Disney World. He also said he would visit me, and I do believe he does. 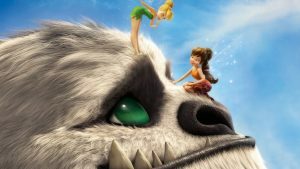 I’ve written about Ben’s love of music and how much he loved to listen to Disney theme park music. He also loved music boxes and I gave him a couple as gifts over the years. I had to have this little music box. I also discovered a Charlie Brown Halloween bed sheet set. Ben would have loved them. We loved It’s the Great Pumpkin, Charlie Brown, and “I got a rock,” was one of his favorite expressions. Once, when I went on a vacation without him, I picked up a tiny rock to bring home to him. My friend questioned it and I said that Ben would understand. Sure enough, when I got home, I placed the rock in front of him and he laughed and exclaimed, “I got a rock!” I decided to order the sheets. 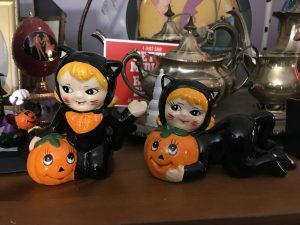 Once on a shopping roll, I also ordered two little figurines- retro inspired little girls dressed as cats with pumpkins. I was not sure how I would feel when these things arrived, but I felt like I had made a good decision to order things that would remind me of Ben but that would be brand new. When the package arrived, I felt nervous. I tried to ignore it for a few hours, but I finally opened the box. First, I saw the music boxes. I played Grim Grinning Ghosts and cried as I turned the crank and listened to the tune, wishing Ben was with me because he would have loved it. I bet he would have figured out a way to make it a ring-tone. It devastates and angers me to think about all that he misses in life, and how much time was taken from us. It may seem silly that a tiny music box would make me feel so sad and lonely at the same time that it conjures such loving memories, but it’s those little shared joys that carry such huge emotion. The Charlie Brown sheet set is adorable, and he would have loved them, too. I have not yet put them on the bed. I stare at them in their package, and I’m almost bracing myself for using them. The little girl figurines are very sweet. My cat, Disney, is always happy to see cats represented since I have so many schnauzer things. I know Ben would approve of them, but they are definitely more of a “me” decoration, which is probably a good thing. With these new decorations, I began to think about all of the things I have in storage. I still was not prepared for anything that I had brought to the hospice room. 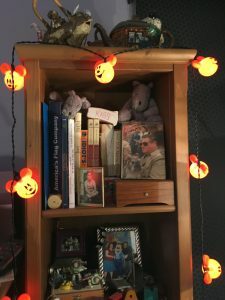 I decided to go to storage yesterday to bring back my Mickey Mouse Halloween string of lights- they are similar to Christmas lights but orange Mickey Mouse faces. When I was across the street from the storage facility I started to panic and choke up. I reasoned with myself that if it was too upsetting, I would just leave. I opened the door to my space, grabbed the lights and then I saw the box with our big Disney Halloween snowglobe. At first, I put it in the bag to bring home, but it started to upset me and I put it back on the shelf. Why were the lights okay but the snowglobe wasn’t? I can’t say. I never know what is going to trigger the tears and wave of grief. Since I had made it this far in my quest to retrieve some Halloween things, I decided to open the Halloween box of Disney decorations. I immediately had visions of how things looked in the hospice. I do not know if I will ever be able to enjoy those things without Ben. 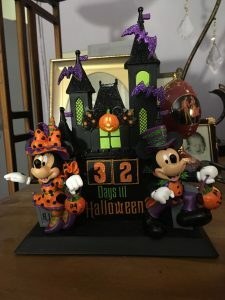 I did find the box that contained what turned out to be a very special gift that I got for Ben- a Mickey and Minnie Halloween countdown figurine. I had gotten it for Ben as a surprise and I set it up by his desk so he would see it when he woke up one morning. He texted me with such delight. Every morning before I left for school, I would change the number on the figurine, and if I forgot, he would text me to remind me! At that point, ALS had taken too much of his dexterity and he could not change the numbers himself. I thought about how much he loved this little figurine that I’d gotten simply as a way to give him some joy and chuckles when he was homebound. It was something that I intentionally did not bring to the hospice room- I was not going to summon any notion of counting down time. Impulsively, I put it in my bag to bring it back home, and then, I changed my mind, thinking it would be too upsetting. In the end, I took it home, thinking that I would see how I felt once I had displayed it. There were many tears when I took it out of the box, but the memories of how happy it made Ben are very good. Last night, I put the Halloween lights on and set out the countdown figurine. I will change the day every day, as Ben would want me to do- 31 days till Halloween, in case you’re counting or curious. As I see it, I am keeping a tradition that was important to him and to us. The hard part is not knowing what will be comforting and what will be unnerving, but I channel my inner Dory and “just keep swimming” through the emotions. Halloween will never be the same, but it feels like I’m finding a way to make it mine while I include Ben, too. If, in fact, he is a grim grinning ghost and he comes to visit, I think he will be happy to see it. I hope so. 2012- Main Street on Halloween was one of our favorite things to see. 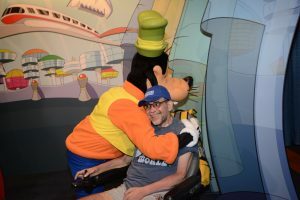 In addition to sharing my Disney-ish reflections on caregiving, grief and beyond, I also want to share resources that can help with caregiving and grief. 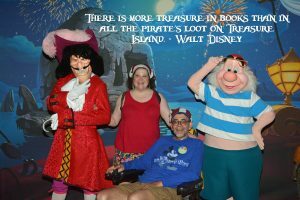 It will not come as a shock that I happen to agree with Walt that “There is more treasure in books than in all the pirate’s loot on Treasure Island.” I guess I was a little like Goldilocks when it came to reading books about caregiving, grief, and ALS—some were too clinical, some were too spiritual or faith-based, some were too heavy-handed, with so much detail that I ended up feeling confused or defeated. I wanted a concise and accessible how-to resource. I recently discovered just that, an easy to read, informative, understandable and engaging book called Home Hospice Navigation: The Caregiver’s Guide by Judith Sands, RN, MSL, BSN, CPHRM, CPHQ, CCM, LHRM, ARM who is a healthcare professional, nurse, recognized authority in the areas of care coordination, quality, risk management, and patient safety. I read many caregiving books, and receive frequent comments from caregivers with questions, concerns and misconceptions of home hospice. I know that it’s difficult to research things when you’re caregiving, and when you do have the time you don’t always have the energy. However, if the notion of home hospice has crossed your mind, I strongly recommend that you take a look at this informative read and wonderful resource that does, indeed, help you to comfortably approach the navigation of home hospice options. 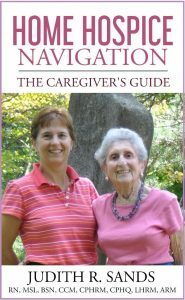 Home Hospice Navigation is written for the caregiver in easy to read, well organized sections, with good advice that is offered as if Ms. Sands is standing next to you anticipating your questions. First and foremost, it clears up the glaring misperception that home hospice is the equivalent of euthanasia and that someone needs to be close to death to receive home hospice services. Instead, Ms. Sands points out that “hospice should be thought of as living fully as long as possible and helping your loved one to die a peaceful and comfortable death.” I have to admit, I found it confusing when Ben was put on home hospice. It was the physical therapist from our visiting nurse program who suggested it when Ben needed more help and was nervous about being alone but reluctant to accept that he needed to hire an aide. 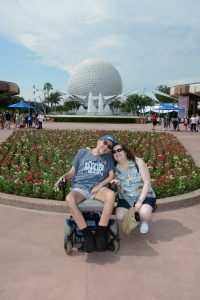 This woman set in motion a process that allowed Ben to receive helpful care, support and medical supplies. As caregivers, we often neglect our own physical and emotional needs and hospice care services also provided a lot of emotional support to me. Yes, there is a trade-off at times with what is covered by insurance, but home hospice is definitely an option worth exploring. This benefit is covered through Medicare, Medicaid and most commercial insurance policies. Ms. Sands lets you know what information is applicable across the board and what may be specific to your state or insurance. Throughout the book you will find anecdotes about Ms. Sands’ experience with home hospice with her mom. 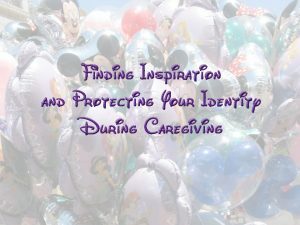 These stories show the very personal inspiration for this book and make it very relatable for many caregivers. 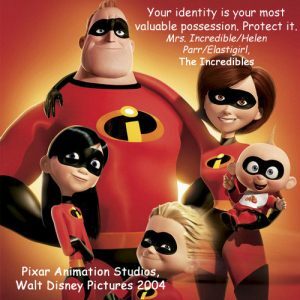 There are references to the important documents that everyone should complete, which are conveniently organized and available through her web site, www.JudithSands.com (the book can also be purchased through her site). Also, you will find suggestions of considerations, conversations that should take place, and a step-by-step, very accessible process for how to begin to engage hospice services and work with medical and related staff. I wish I had this book when Ben and I were making decisions about his health care. I highly recommend Home Hospice Navigation: The Caregiver’s Guide to those of you who are daunted by home hospice and do not know where, how or whether to consider it as an option. The book can be purchased in paperback or digital versions through JudithSands.com. Please feel free to contact me with any questions or comments.